CapTrader is an owner-managed Forex Broker and is operated by the German FXFlat Wertpapierhandelsbank GmbH. This broker is neither one of the oldest nor the most famous but enjoys a very good reputation for several reasons. On the one hand, CapTrader is definitely one of the reputable brokers and on the other hand, the trading platform, the customer support, and the trading offer leave a professional impression. Due to the relatively high minimum deposit, this broker is more suitable for experienced traders. The Forex Broker CapTrader is operated by FXFlat Wertpapierhandelsbank GmbH. Behind them stands the well-known company Interactive Brokers from England. However, the broker is owner-managed and has its headquarters in the German city of Ratingen. As a result, the broker is subjected to BaFin by the German Financial Supervisory Authority and is strictly regulated and controlled by the German Financial Supervisory Authority. In addition, the broker is subject to regulation by the British Financial Supervisory Authority (FCA). With this double security, customers need not worry about the credibility of the broker. All customer accounts and deposits are protected up to a maximum deposit of 30 million. Cash deposits are protected up to 1 million. If the provider becomes insolvent, trader needs not to worry about his/hers money. To open a trading account with CapTrader, a deposit of at least â‚¬ 2,000 must be made. This is a very high amount compared to other Forex brokers and this frightens many potential new customers. For beginners or traders with limited financial resources, CapTrader is therefore less suitable. This is also one of the main reasons why CapTrader does not have as high a number of users as other well-known brokers. Experienced traders and traders with sufficient financial resources, however, greatly appreciate the trading platform of CapTrader. Customers who choose CapTrader benefit from a good selection of trading offers. Traders may trade currencies, equities, securities, futures, EFTs, CFDs, and securities. The selection of shares is significant, according to own data the customers are provided with choice of more than 1.2 million different shares. For this reason, CapTrader is one of the best Forex brokers for customers who prefer to trade with stocks. In addition, CapTrader’s customers can also benefit from a wider range of exchanges – more than 80 different exchanges. Trade is therefore possible in Europe, Asia and America. Traders only have to take into account that the conditions differ from market to market. In Germany the prices per order are between 4,00 Euro and 120,00 Euro. The commission that CapTrader receives is between 0.1 percent and 0.25 percent. Traders receive a suitable securities account free of charge. This is truly exemplary and one of the great advantages of CapTrader. In addition, every customer of CapTrader receives a free clearing account, including trading and clearing at International Brokers. For major currencies, such as EUR / USD, the spread is 0.2 pips. This is a very good value compared to other Forex brokers. Also for limiters, the broker does not charge additional fees. The leverage ratio is not particularly high. The traders can use a maximum of 40:1. Higher winnings are therefore also possible for a higher profit and this goes hand in hand with the high minimum payment. Customers of CapTrader who want to maximize their profits should compare the order fees exactly before each trade. The Forex Broker attracts not only with an extensive range of securities but also offers its customers several trading platforms. The Trader Workstation is the standard platform of CapTrader. In detail, it is a software that can be downloaded free of charge and installed on the computer. The workstation works not only under Windows but also under Macintosh OS and Linux. 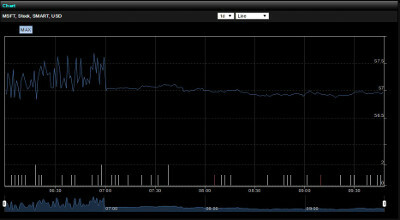 Alternatively, CapTrader also offers its customers a WebTrader. This trading platform does not have to be installed on the computer and runs directly via any Internet browser. The Trader workstation is stable and reliable and has a clear interface. It has several extras that simplify trade. Through the ChartTrader, customers of CapTrader gain insight into the current development of the different securities on the various markets. Alternatively, customers of CapTrader can also gain access to the proven platform agenda trader. The access is completely free and with other providers it costs quite a lot of money. However, the Forex Broker also supports other trading platforms that customers can download externally. Among the choices are the famous NinjaTrader and Multicharts. The API also supports Tradesigna and Invetox. Traders, who prefer to travel, can also be fully satisfied with CapTrader. The free mobile apps are available for Android, iOS and even for BlackBerry. Traders, Who are interested in the offer from CapTrader and would like to get to know it without risk, can simply open a demo account. This is completely free of charge compared to the classic live account and still offers the customer all functions. Due to the high minimum deposit, a demo account is extremely important for many potential new customers. In contrast to many other brokers, CapTrader renounces different account models. Opening a live account is not difficult and takes only a few minutes. New customers must fill out a form, enter their mobile phone number and email address. In addition, in order to open an account, it is necessary that the users provide a copy of their ID or passport to CapTrader. The minimum age for a cash account is 18. Customers who wish to open a margin account must be at least 21 years old. The minimum deposit of 2,000 euros or dollars can be paid to the trade account only by a bank transfer. Because of that, it takes a few days for the trade account to be used. However, all bank transfers are possible free of charge. Payouts can also be made by bank transfer only. Within 30 days every SEPA payout is free of charge. For each additional transfer, the customers of CapTrader must pay a fee of 8 euros. Payouts are usually credited to the bank account within a few business days. Deposits and withdrawals are possible in the currencies Euro, US Dollar, Swiss Francs and British Pounds. In contrast to many other Forex brokers, there is, unfortunately, no bonuses for new customers. There are no special bonuses. Customers of CapTrader have the opportunity to be advised over the phone by highly competent and friendly staff. Particularly praiseworthy is the free call-back service. Customers will be recalled by a support staff within a maximum of one hour. Alternatively, the traders can also use the comfortable online chat and talk about the issue in real time with one of the staff members. Support requests by e-mail is also available. The Forex Broker CapTrader is very well positioned in terms of training opportunities. The offer to their customers a wide range of training courses. This includes, among other things, videos, manuals, and tutorials on different topics. Webinars are also available free of charge regularly. Inexperienced traders can thus get a very good overview of foreign exchange trading. Nevertheless, the training program is aimed primarily at professional traders. CapTrader is a serious Forex broker and is regulated by the German as well as by the English Financial Supervisory Authority. Thanks to a high deposit guarantee, customer deposits are always reliably protected. For German traders, the broker is, of course, particularly well-suited. The commercial offer is wide and serves every taste. Doubtful new customers can create a demo account within a few minutes without any risk or expense which will provide an extensive insight into the trading platform and features. Cons. of CapTrader are the high minimum deposit, the non-existent bonuses or commissions and the non-existent selection of different deposit and withdrawal methods. What works for this broker are, the first and foremost, customer support, the low fees, the wide selection of foreign exchange and equities, and the professional trading platforms. Overall, CapTrader is a very serious and recommended Forex Broker. This broker is ideal for traders who trade with currencies or shares. Due to the very high minimum deposit, the Forex Broker is less suitable for beginners and for inexperienced traders.